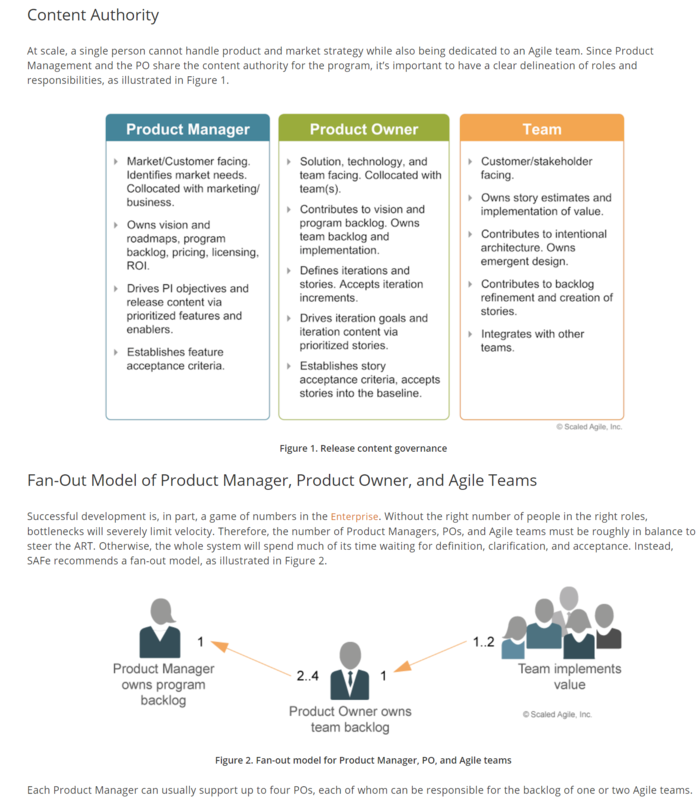 What is the origin of the term “Product Owner” in Scrum? Or phrased differently: Why is the role called Product Owner? I spent some hours researching the term's etymology, but I haven't been particularly successful, which is why this question came to be. I am explicitly not asking about the definition of the role here. There are plenty of articles explaining that e.g. in the context of Scrum. In particular, I am interested in the historical reasoning that has led to denoting it as an "owner". It might also make sense to share some context with you to explain why this question came up in the first place: My experience is that teams unfamiliar with agile methodologies tend to replace the term "owner" in their minds with some variation of a role they already know from traditional hierarchies. This often leads to an interpretation that puts the Product Owner into some kind of principal or even boss position, which may be in stark contrast to what one wants to achieve when implementing agile processes. To be specific, what people intuitively interpret might yield views contrary to servant leadership, self-organizing teams and evolving situational hierarchies. That is why it might be necessary to better explain the context in which e.g. the Scrum definition of the "Product Owner" role should be seen with respect to the goals of the company where it is being implemented. Getting an idea about the intentions of naming it "owner" in the first place might help with that. I've always interpreted it as being because the Product Owner (PO)... owns the product. S/he is the stand-in representative for the end-customers whom will be the ones literally owning the product in the future. As such, his/her responsibilities are somewhat similar to what the on-site customer's would be in eXtreme Programming. And while the Customer is Always Right™, the Customer is Not Your Boss. Your boss is your boss. Hypothetically one individual could fulfill both roles of PO and manager, but I would personally advise against it - they are distinct roles with distinct responsibilities and goals. Just as the customer and the boss would be. There's nothing in there even about servant-leadership, let alone 'normal' leadership. The Scrum Master is the servant-leader of the Scrum Team. The PO is just another member with different responsibilities. Their responsibility is to pretend as if they own the product. Beyond what is the in the tactical role description, I've always looked at the role as the judge or arbitrator when the team can't come to consensus on the decision that needs to be made to keep the delivery on track, hence they are the "owner" of the decision. They need to listen and understand the engineers point of views and differences thereof, as well as that of the business stakeholders. Servant leadership and empathy play critically into this role, if the PO is to be successful in managing such complex matrixed relationships. You'll have to ask Ken Schwaber or Jeff Sutherland where they coined the term from. The source of the term does not appear to be publicly documented, but they likely introduced it somewhere between 1995-2001. During the 90s, a number of people were examining agile practices and ideas. Scrum and XP are two of the frameworks developed during this period, with a formal definition of XP apparently predating that of Scrum by a few years. The Scrum role of Product Owner bears a close relationship to the role of on site customer in eXtreme Programming. Arguably, XP uses terms that speak to development team members, while Scrum uses terms that try to appeal more to business stakeholders. (This type of business-oriented terminology is even more apparent in frameworks like SAFe.) It could be further argued that the on-site customer is a role that is defined largely from the team's internal perspective, whereas a Product Owner is role with delegated responsibility from the organizational perspective. Consider the following examination of "ownership" to see why this may be so. The Product Owner is the sole person responsible for managing the Product Backlog...The Product Owner is one person, not a committee...For the Product Owner to succeed, the entire organization must respect his or her decisions. Basically, I've always interpreted the "ownership" portion of the term as a way of ensuring that the Product Owner role is a singular person rather than a committee, which in turn is intended to streamline the framework and reduce the organizational burden of providing on-site customers. In governance frameworks, the roles of Application Owner or Data Owner are often structured in a similar way, in order to facilitate communications and create accountability. This chain of reasoning provides a pragmatic explanation for the introduction of the term, and provides some explanation for its utility value over other related terms. However, only the framework's authors can canonically ascribe how the term was decided upon for Scrum. I suggest looking at the major roles in an agile team. It's critical to understand everyone's role holistically so that it all makes sense. If the team has latched onto a specific term "owner", it may be because they're seeking authority or control and not looking at everything involved. Highlight all the roles and responsibilities and let them figure out where they want to be based on their values and skills. While every situation is different, having clarity for the roles, motivations and responsibilities will let you adapt your team for your size and goals. Not the answer you're looking for? Browse other questions tagged scrum agile project-management-style product-management product-owner or ask your own question. In an agile process, should there be PMs in agile in the first place? Or Should they be replaced by a PO (Product Owner), or -may be- a Scrum Master? Product Engineer - How and What to Learn? How to deal with the current corporate food-chain going in the way when adopting Scrum? Is the Product Owner the Customer? Is the Product Owner allowed to be at the Daily Scrum event? At what Work Item level does the Product Owner prioritize in TFS? Is the product owner responsible to make long-term estimations about PBI in Scrum? What kind of backlog review is this?